Concept for the Bayline project. Miami isn’t known as the most pedestrian friendly city, but change may be on the horizon, two new urbanization projects–Baywalk and the Underline– aim to create public walkways throughout the Magic City, forming a new way to see the city and a friendlier place for pedestrians and cyclists. Realty company the Related Group has big plans to make the entire waterfront a public pedestrian-friendly walkway by linking Edgewater’s Bayfront, the Julia Tuttle Causeway, and Museum Park together. 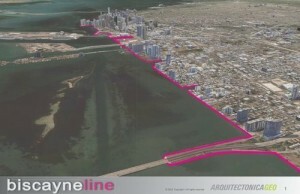 The Related Group commissioned Arquitectonica to survey the property that would become Baywalk. 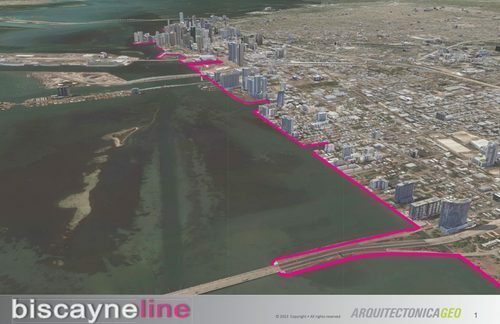 Arquitectonica’s survey showed that a substantial portion of Baywalk has already been built. Brickell Key Park now encompasses about five miles of the proposed walkway, and Museum Park’s bay front is also accessible. Building a well-defined path connecting all sections of Baywalk could take time, but it is possible. 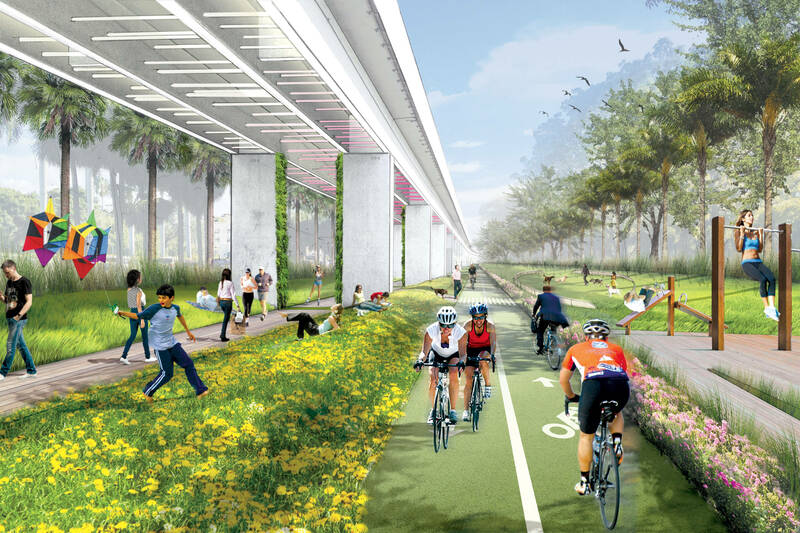 A new public development termed the Underline Project proposes to turn 10 miles of vacant land below the Metrorail station from the Dadeland South Station to the Miami River Station into a safe pathway for both pedestrians and cyclists. The Underline concept was created by marketing executive Meg Daly who fell off of a bicycle and broke both arms. Before her accident, she never noticed the under utilized strip of land along the M-path, which is the right-of-way beneath the Metrorail tracks. Unable to drive, Megan was obligated to take the Metrorail to her therapy sessions and walk along the path. Daly then took her idea for the Underline to several public officials including heads of parks and recreation and public transit. The Underline was inspired by the creation of separate bikeways in Dutch towns that physically separate cyclists and pedestrians from cars, ensuring more safety and promoting extensive, everyday use by riders. Concept for the vicinity of University station. To demonstrate what could be possible for the Underline, University of Miami School of Architecture students in Spring 2014 developed ideas for ten one-mile segments specifying how the space could be re-purposed to include playgrounds, soccer fields, observation decks, sculpture galleries, and sunken gardens. On February 2, the Friends of the Underline will announce the winner of their design competition, which was launched this past December. Ground-breaking is expected for 2016. This entry was posted on Monday, January 26th, 2015 at 5:35 am and is filed under Downtown Miami, Miami, Transit, Uncategorized. You can follow any responses to this entry through the RSS 2.0 feed. Both comments and pings are currently closed.